The Hundred Peaceful and Wrathful Deities (Tib. ཞི་ཁྲོ་རིགས་བརྒྱ་, shyitro rik gya, Wyl. zhi khro rigs brgya) include the forty-two peaceful deities and fifty-eight wrathful deities. 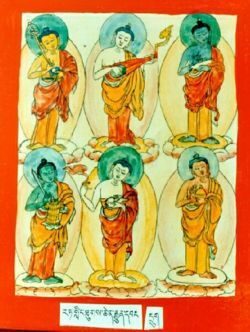 They feature in several practices and cycles of teachings, most notably the Tibetan Book of the Dead and the Guhyagarbha Tantra, which is the primary source describing this mandala. Ghanta (Skt. Ghaṇtā; Wyl. dril bu ma or spyang gdong ma) also called 'Wolf Face' or 'the Bell', guarding the north gate and in union with Amritakundali. Karmaheruka and his consort Karmakrodhishvari. 5. The last group is composed of the four female outer-gate keepers. The fifty-eight wrathful deities become sixty when you add Chemchok Heruka (Wyl. che mchog heruka) and his consort Krodhishvari, who are the wrathful aspects of Samantabhadra and Samantabhadri. Tulku Pegyal Rinpoche, Lerab Ling, 16 August 1997, Shyitro empowerment from the cycle of Jatsön Nyingpo, Könchok Chidü lineage. Sogyal Rinpoche, The Tibetan Book of Living and Dying, revised and updated edition (Harper San Francisco, 2002), page 284. This page was last edited on 7 June 2018, at 14:00.